The new SQ-Pad 12, has a maximum thickness of 4 mm and initially feels both exceptionally firm and of high quality. Everyone that rides regularly knows that for rides of over 30 min duration, a saddle with thin firm padding is considerably more comfortable than a saddle with thick soft padding. The same is true for a chamois. Most chamois are about 12 mm thick and soft - UNTIL NOW! A too soft saddle usually becomes very uncomfortable after approx. 30 – 45 minutes on the bike. The sit bones sink in so far, that sensitive soft tissue such as muscle and tendons are aggravated. After approx. 30 – 40 minutes a dull deep pressing pain sets in. 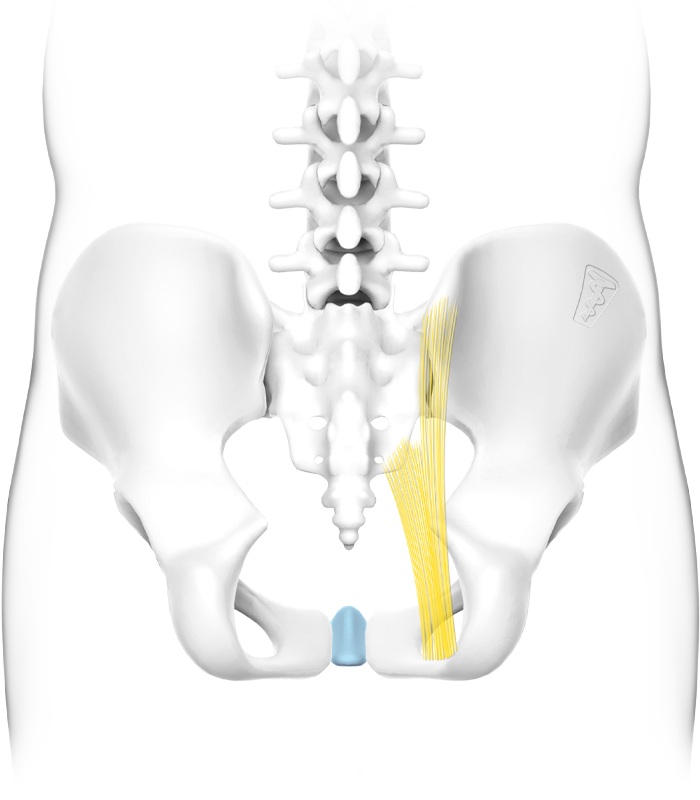 The sinking in of the sit bones also causes the perineal area in men and the lower positioned pubic bone arch in women to be subjected to higher pressure. Specifically soft padding will effectively stop the blood flow. The question now is why we ride taut, slim saddles, but make a soft saddle again with the thick, super-soft padding that we often wear in our cycling shorts. The effect of the soft saddle (in this case: hard saddle + super soft pad) then again leads to the serious impairments of sinking, the restricted blood supply and the increased friction. 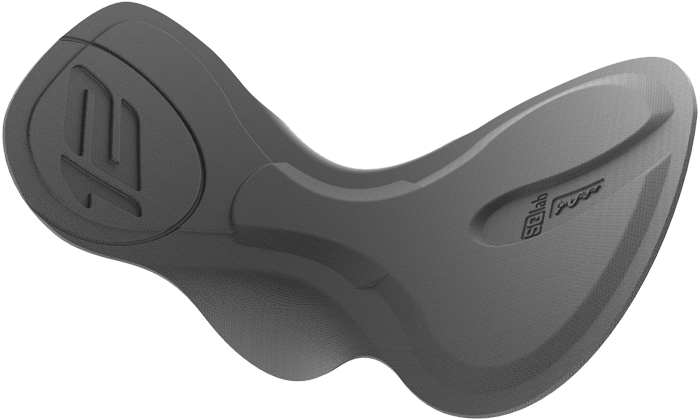 With the SQlab Pad Technology we have succeeded in eliminating the effect of a soft saddle. 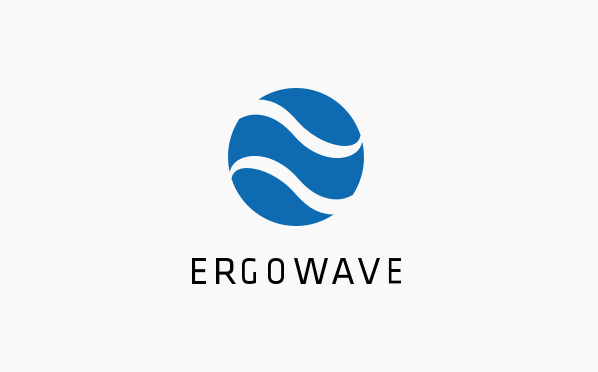 After a long development time we have developed an ergonomically high-quality pad with the characteristics hard, thin and firm. Soft saddles are usually only suitable for short distances of approx. 30 - 45 minutes! The effect of a soft saddle can also be achieved by combining a tight saddle with a soft, thick trouser pad. SQlab advises to avoid this effect and to pay attention to the thickness of the pad as well as to avoid soft saddles. While width is important for a saddle, a pad for shorts depends on shape. The SQlab pad tends to be wider in the rear area and converges into a very narrow center. 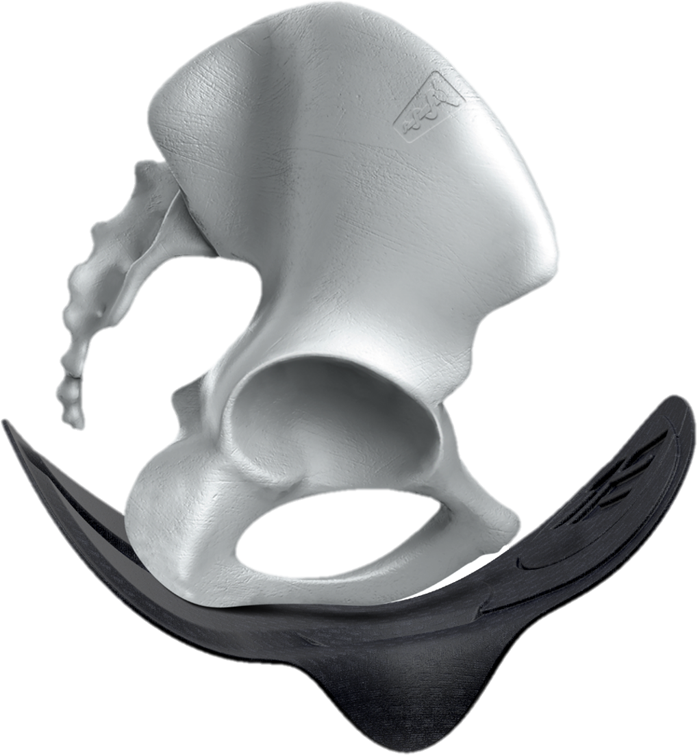 The sitting bones thereby seat fully on the maximum shock-absorbing area without creating folds. 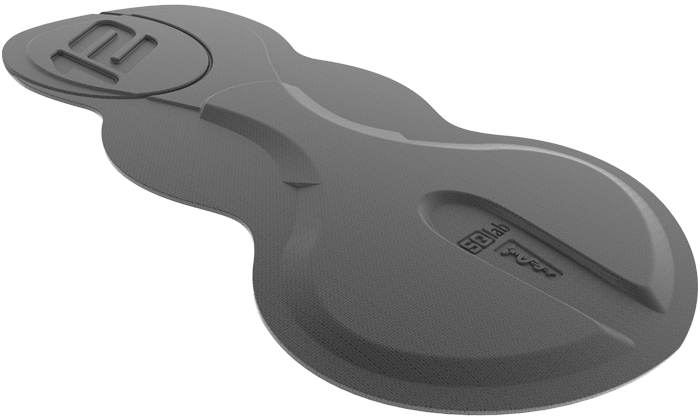 The SQ-Pad 12 is designed for seat bones spacing of up to 15.5 cm. 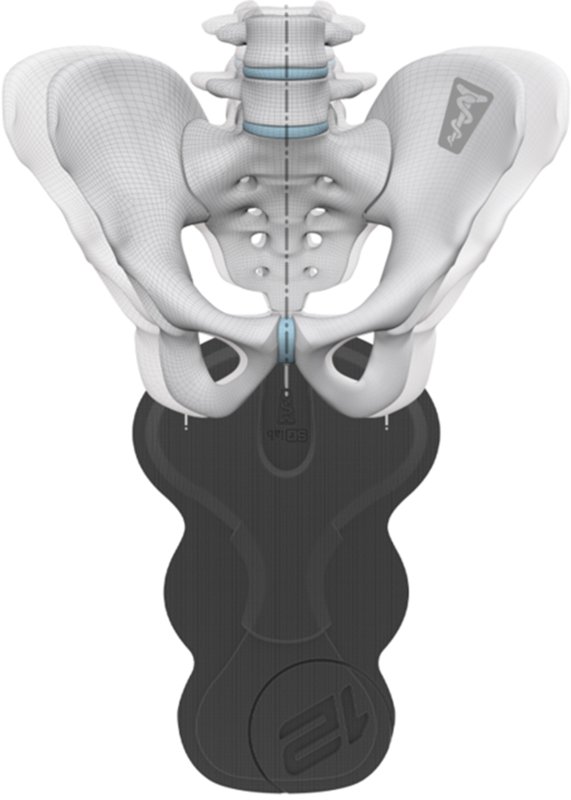 The SQ-Pad 12 is highly tailored and designed for a distance of 15.5 cm between sitting bones. No shortcoming in terms of ergonomics or comfort. Why haven't tight trouser pads been around for some time? Because high-quality foams with better damping features have a higher density and thus lose their breathability. By means of a patented process, we have managed to break up the structures of the very dense foam. 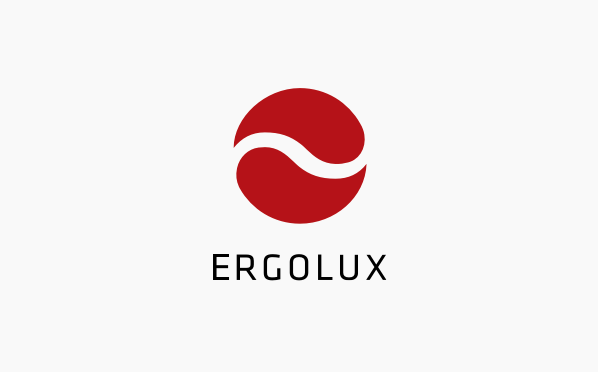 The result is a high breathability, comparable to conventional upholstery or even better. The perfect cushioning remains fully intact. Painful sitting bones initially get used to the strain - this is quite normal. The pain is caused by the periosteum, whereby the pressure is less the problem than the shearing forces caused by the pedalling movement. The slight but constant movement of the pelvis on the saddle causes painful shearing forces on the periosteum. The SQlab trouser pads SQ-Pad 10 and SQ-Pad 11 have a thin layer of an orthopedic TPE gel. This gel has been specially developed to absorb the shear forces in the medical field and thus to avoid friction. From the idea to develop an ergonomic trouser upholstery three pieces were created, with the aim to create the best comfort for every sitting position. Our ONE10 short is a pure underpants and is optimized for this use. The SQlab underpants are for an upright sitting position or for all who don't like skintight Lycra shorts. True to the motto: No Lycra, No Strava, No Problem. 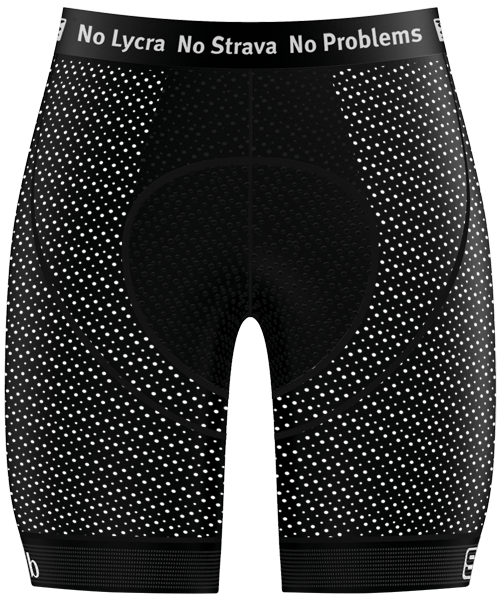 The SQlab Short ONE10 is a pair of underpants which has been optimized for this use. The heart of the ONE10 is the pad SQ-Pad 10, which is maximum 8 mm thin and still tight. The pad consists of a dense and at the same time extremely breathable foam, which is equipped with a thin layer of a TPE gel on the underside. This serves for the optimal absorption of the shearing forces arising during the pedalling movement. For the highest degree of breathability, the SQlab underpants with a special Lycra, which provides an optimal degree of ventilation. The Flatlock Stiching helps effectively to avoid unpleasant pressure points. In addition, the elastic cuffs at the leg end provide a secure hold without cutting in. Universal suitable for every seat bone distance. The SQ-Short ONE11 is equipped with the SQ-Pad 11, a maximum 6mm thin and tight padding. The pad consists of a dense and at the same time extremely breathable foam, which is equipped with a thin layer of TPE gel on the underside. This serves for the optimal absorption of the shearing forces arising during the pedalling movement. 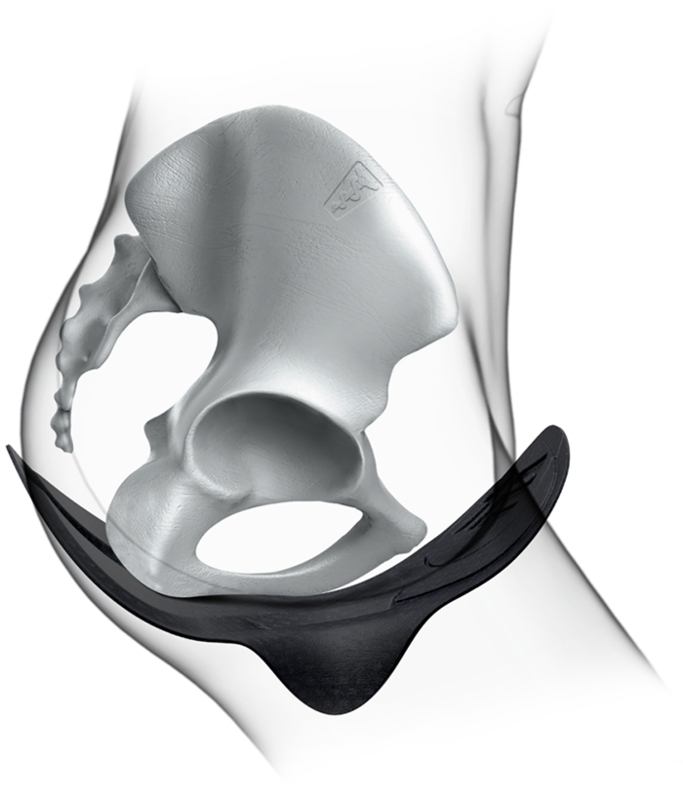 Another special feature of the SQ-Short ONE11 are the removable SAS-Tec Tripleflex protectors at the level of the femoral neck and hip joint. These are designed to protect the sensitive neck of the femur, especially in the event of falls. The breathable, elastic straps and the honeycomb cuffs ensure a perfect fit. The heart of the ONE12 is the SQ-Pad 12. The maximum 4mm thick pad feels exceptionally tight but still high quality. But anyone who rides a lot knows that the tight and thinly padded saddle is much more comfortable than the soft, thick saddle when riding for about 30 minutes or more. This is no different with a trouser pad! 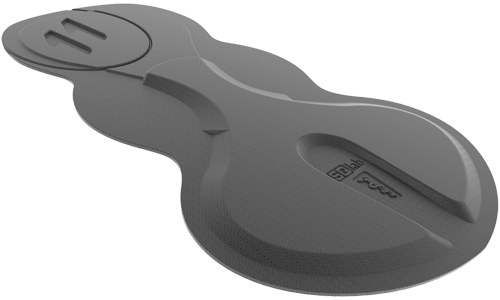 The SQ-Pad 12 feels more comfortable as the mileage increases without the material yielding. The high performance fabric in combination with the elastic, but nevertheless very breathable cuffs and straps provide an optimal fit with stretched seat position as well as light compression with optima-ler freedom of movement. Universal suitable for any seat bone distance.